It's probably one of the smallest rooms in your home. But when your laundry room is firing on all cylinders, the washing machine is rumbling, the dryer is tumbling and your feet are moving at a frantic pace to organize the output. Match the size of the load to the water It may sound obvious, but it's easy to skip this step if you're used to washing large loads. On average, washing machines account for about 15 percent of the water bill in many American homes. Wash clothes in cold water. Warm or hot water can cost 10 times as much as cold water. Besides, cold water will help your clothes retain their color, too. Avoid the “heavily soiled” or “permanent press” settings, unless you really think you need them. The “normal” setting cleans most soiled loads, and it uses about 5 gallons less water. Try to wash and dry multiple loads in succession, before the dryer cools down. Removing clothes from a hot dryer and then filling it up with another load will save you the energy it takes for the dryer to heat up from a thoroughly cooled down state. Clean the lint trap in the dryer at the end of every session. You'll keep a robust flow of air moving in the dryer so it doesn't have to run as long. You'll also keep lint from adhering to your clothes. Make a dryer vent service appointment once a year. Just as you make a “tune-up” appointment for your air conditioner and furnace, it makes sense to have a technician clean out the vent to remove any obstructions – and reduce the risk of fire – and check that the vent has not been compromised. A crushed vent restricts air flow, wastes energy and also can pose a fire hazard. Hang some laundry on a drying rack. It takes longer, and unless you use fabric softener, your clothes may become stiff as a result. But a drying rack is a fine way to cool down your laundry room from the heat that can fester there after a long day of doing laundry. It can save you money, too. Consider an Energy Star washing machine when you must replace your current machine. Some models use 40 percent less water and about 25 percent less electricity than other washers, the department of energy says. 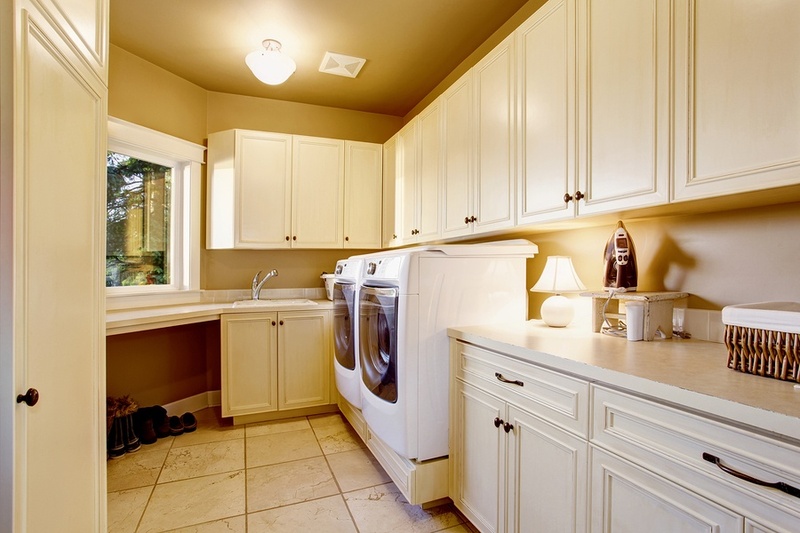 Consider duo shades for your laundry room. Made by Polar Shades, these nifty window treatments allow you to save energy by giving you the option to block the sun (and cool down your laundry room) or let it stream in (and warm it up). Polar Shades manufacturers shades as practical as they are stylish. Make an appointment for a free in-home consultation with a window expert from Polar Shades – and then watch your laundry room fire on all cylinders. Call 702-260-6110 to get started.